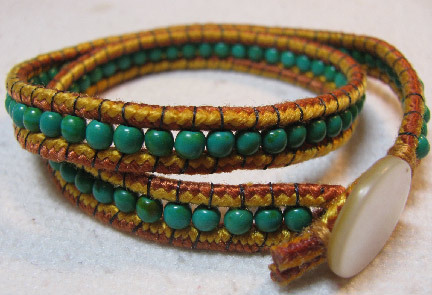 Last week was Part one of this wrap bracelet tutorial. So, did you try making any of these? Have you made some in the past that you'd like to show off? Just drop me a line, and I'd love to share your work with everyone! 6. Following Pam's lead from last week, I made this one with waxed linen and Nymo thread, but with no embroidery floss. 7. Stone chips can be used instead of regular beads or crystals. 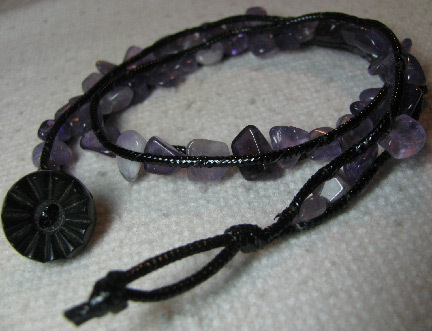 I used a plasticized cord and Nymo thread to make the amethyst bracelet, satin cord and Nymo for the turquoise one. 8. 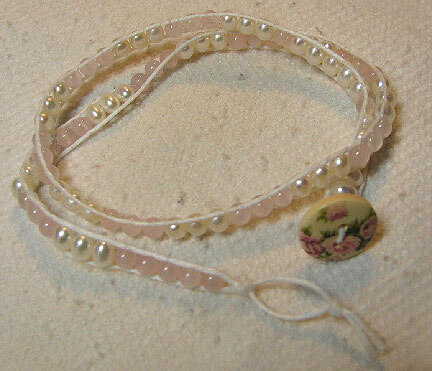 It occurred to me that a boot lace would make an awesome (and inexpensive) stand-in for leather cording. 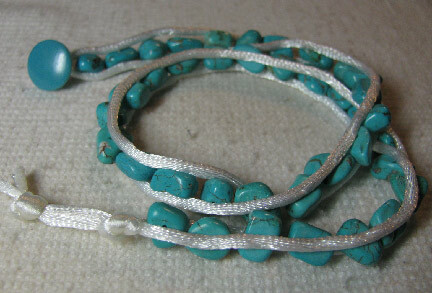 4mm magnesite beads (from Auntie's Beads) are strung on with black Nymo thread. 9. When you get to the end, tie an overhand knot right up against the last bead, and another knot far enough away to accomodate the button. Glue or Fray Check the ends, and trim when dry. Thanks for sharing both of these tutorials...this would be a great project for grand daughter(s) and grandma(s)!!! Hmmmmmm that's me isn't it! HA Now to find the time! !